There is a lot of data showing the engagement of women online, especially highly desirable family oriented professional moms who have considerable influence in automotive purchases, women influence 85% of all the car buying decisions. One key category that is getting a ton of attention is the “Read Blogs” statistic. With all the hype around mommy bloggers who are showing up in all kinds of traditional media outlets with stories showing highly successful bloggers getting perks from companies and, more importantly, having influence on other female consumers, it is no surprise that automotive brands want to reach out to these influencers. With all this attention, it would seem a mommy blogger outreach would be a slam-dunk for any automaker with an impressive new product that is perfectly targeted to cool, trendy mommy bloggers and their readers. So the marketing department develops a profile showing some hip, trendy mom who can flawlessly juggle life via Blackberry, running a bunch of kids around town and finding time to hit the spa between soccer and dance classes. North Texas Chevy Dealers took their new family hauler, the Traverse, to moms by giving the SUV to them for 8-weeks, plenty of time to write and create stories around the Traverse. All the while, the bloggers were competing for a prize and readers could also win a prize in a drawing. 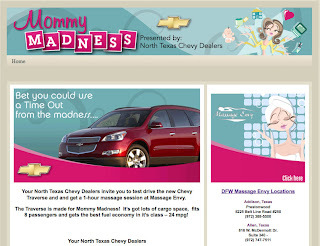 From April – June, readers were to visit the mommy madness local sites (two in Dallas and one in Kansas City) where the voter is entered into a contest to win a resort trip and vote for their favorite mommy blogger who would also win a prize if they were voted the top spot. I love the idea of giving bloggers the car for such a long time. Eight weeks really gives the women some quality time to experience the vehicle and write about their use and share their honest feedback. It's a great way to gain some consumer insights from a customer perspective. One mommy blogger, and there are several examples showing the same results, had no engagement on her site when she wrote about the contest or SUV (no engagement = no comments.) Bloggers were directed to post the reviews, not on their blog, but on a separate site. That’s due to Chevrolet and CBS Radio, the two sponsors, creating sites to host the blogger articles and videos. Funny thing is that all of the content the bloggers created, minus a few videos on YouTube, all went away and are no longer viewable on the web since the sites have been shutdown. YouTube videos from the contest show on average 47 views with the top video getting a whopping 126. Seems engagement was very low with the content, probably partially due to the contest creating sites outside of the very blogger audiences they wanted to reach. Why on earth would you reach out to mommy bloggers who have established audiences, have them post your product’s content on some separate contest website and then delete all the content when the contest wraps up? This has to be about the crazyiest way to tap into the built-in audience a blog has. Instead the result is that there is very little content on YouTube (think needle in a haystack) and very limited reviews on mom blogger websites from people who lived with the vehicle for 8 weeks. Chevrolet spent all this time and money to create user-generated content only to have it live for three months. Huh? So even though the product is aimed right at the busy mom target, it doesn’t mean mommy blogger readers care enough to talk about a $30,000 plus vehicle. What is also interesting is how few comment on the attributes of the car (one post I found finally had some car related comments, because it focused entirely on the driver’s favorite things.) Leaving me to wonder is a car too much of a considered purchase that few mommy blogger readers care about as they do with day-to-day consumer goods like food, sundries, and child-focused products? Is this good? Tough to know if media buys also drove visits or was traffic only from the mom bloggers the source. My guess is that media buys were limited, if any at all, since the contest was lead not by Chevrolet the brand, but by the regional North Texas Chevy Dealers. When leveraging a blogger's audience, don't have the readership go out to your marketing website to read reviews about your product. Drop off has to be huge and loses the whole point of engaging that blogger - her readers. Hosting content on a marketing site that you intend to shut down after said contest also loses all of the great content the bloggers created for your product. This great content is no longer available when others are researching your product. The contest element is interesting and will entice some readers to jump to an unfamiliar website, but as one friend of mine once said, "contests should read: Enter for your chance to lose..."
Finally, there is a big question of whether mommy blogger engagement is right for automotive brands. Sure the appeal of the demographic is there, but do people visiting sites - mainly focused on parenting and household dynamics - really care to engage with a highly-considered purchase like a car/SUV? One thing is certain, the mommy blogger community is too intoxicating to ignore for marketers and future examples of blogger engagement may prove more compelling than this regionally focused one from a dealership group was.